As Louisiana’s wetlands and mangroves retreat, the low-lying state becomes more and more susceptible to hurricanes and other coastal disruptions. 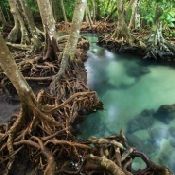 Fortunately, mangrove forests also pull massive amounts of carbon out of the atmosphere and store it in the ocean floor. A new study says that carbon finance could provide up to $1.6 billion for wetland restoration in that state. 23 February 2015 | A two-year assessment of the potential to develop blue carbon projects on Louisiana’s coast estimates that carbon finance revenue can provide up to $1.6 billion in critical funding to assist with wetland restoration over the next 50 years. The study, supported by Entergy Corporation through their Environmental Initiatives Fund, and prepared in partnership by New Orleans-based Tierra Resources and Portland-based nonprofit The Climate Trust, examines existing wetland restoration techniques river diversions, hydrologic restoration, wetland assimilation, and mangrove identifying areas for future scientific investigation to support carbon offset programs. Initial study findings showed that restoration in Louisiana has the potential to produce over 1.8 million offsets per year; almost 92 million offsets over 50 years. This is the equivalent of taking approximately 350 thousand cars off the road each year or 20 million cars off the road over 50 years. Wetland restoration techniques identified in this study could potentially generate $400 million to $1 billion in offset revenue depending on the dollar value of the carbon offset with the potential for almost $630 million more by including prevented wetland loss in the carbon accounting.